Wood based laminated plaques preserve news articles. 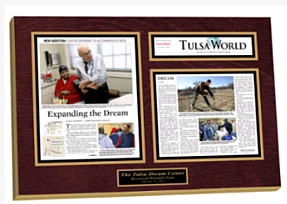 Laminated plaques are the perfect way to create a keepsake out of any article. They are stylish and durable ; ideal for displaying on the wall of one's business or hanging proudly above the fireplace at home. Preserving articles in this way shields them from the damaging effects of time. These sturdy plaques can withstand the test of time and will be invaluable heirlooms for future generations. By preserving an article in this way, one ensures that their message will live on; a record of past successes and memories will always remain. There's nothing quite as exciting as seeing one's name in print for the first time. The joy and pride that swell up inside us should be preserved and revisited again and again. Laminated plaques are the best way to turn that achievement into a lasting keepsake. Anyone who has ever had an article published highlighting their success or the success of their business knows how exciting it can be and knows how important it is to save that piece of memorabilia. The traditional approach of simply cutting out the article and framing it is a nice idea. However, over time the paper will yellow and disintegrate. The testament to success will crumble, disappear and soon enough it will be forgotten. Having the article laminated on a wooden plaque is the best way to avoid losing or damaging these irreplaceable mementos. These keepsakes are not only ideal for preserving articles, they are perfect for creating lasting, durable memories out of any sort of document or photograph. In order to protect these important documents, articles or other invaluable paper treasures, the best option is to have them made into laminated plaques. Good press is worth preserving. Small businesses, shops and eateries will find the use of laminated plaques ideal for displaying their successes. Patrons are reassured when they see positive articles displayed at an establishment and are more likely to return there when they have confidence in the services. Laminated plaques are the best way to display, commemorate , and preserve articles, documents and photographs and ensure that these priceless treasure endure. In The News custom laminates news articles for display. You can visit our website @ www.inthenewsonline.com or get a quote today on new and old articles to be framed.